How a North Texas artist makes a home with his partner who lives 1309 miles away. Jesse Chandler is a Denton-based composer and musician who plays with the bands Mercury Rev, BNQT and Midlake. For Valentine’s Day, he wrote this essay about distance. 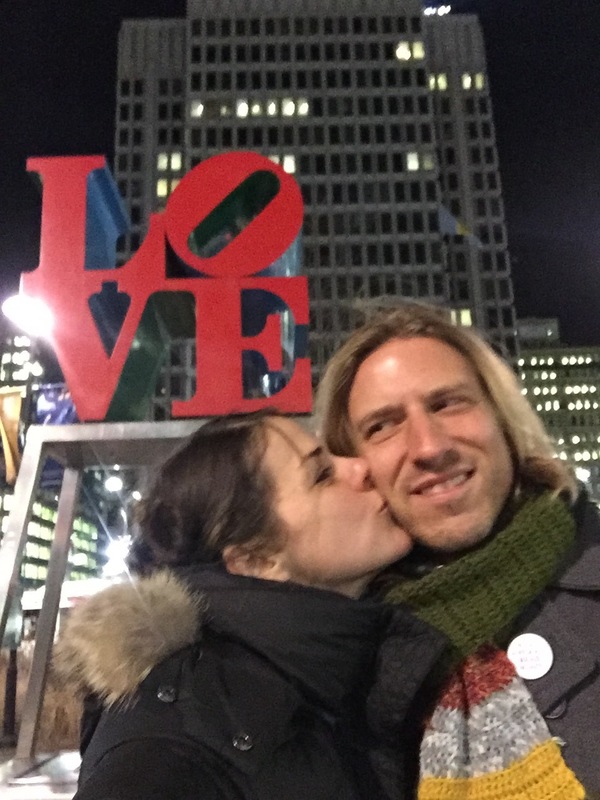 The biting wind felt like a personal affront, but Larissa and I were together on Valentine’s Day. As we rambled through the Philadelphia Art Museum faster than Jeanne Moreau and Oskar Werner on roller skates, we claimed our favorite pieces in each room. Larissa chose the Kandinsky for our pretend country house in the Catskills — “actually, on second thought, it’s too … yellow,” she laughed. I selected a Miro for our make-believe brownstone in Park Slope. Outside we awkwardly swapped photo ops with another couple in front of the LOVE sculpture, and asked for a second take to achieve the maximum level of affection commanded by the monument. We chatted briefly. Sallie told us she was a graduate student at the school of Education at Drexel; Malcolm a psychology major at Temple. They’d be getting married shortly after graduation in May. Then they’d move together, perhaps to San Francisco, where they would enjoy finding hidden speakeasies, or New York, where they’d go birdwatching in Prospect Park. After several minutes of polite small talk, I gently nudged Larissa. We needed to make our way to Historic Verizon Hall if we were to catch the opening strains of the symphony. In truth I knew we had plenty of time. I just wanted to extricate myself from yet another exciting story of a bright-eyed young couple with an even brighter future. It was too sad-making. I’d be on a Spirit Airlines flight back to Texas the following day. Larissa would chase it with her paper airplane care packages, love notes written on the wings. From our corners 1,309 miles apart in Denton, Texas and Doylestown, Pennsylvania respectively, we find moments worth living for in the day-to-day, and list them in missives for each other. Of course sometimes our lists intersect. If you run at a certain speed along a fence, you find a portal through the cracks to other lives: families sitting down for a picnic, or playing in the pool. Like a zoetrope. Or the glow from a movie screen, illuminating a stranger’s expression. Together we’ve built a movable tent of sorts. In a permanent long distance relationship, where neither party is able to move with children from previous relationships, we live only for the next shared moment. Distance. The word alone tightens my chest, knots my stomach. As a touring musician in four bands, I am accustomed to long periods of distance from people I love. Being away from Larissa — this was something unlike anything I’d ever experienced. It was like living in a world without music. Worse, even. One year and a half into the relationship, the desire and love we felt for each other had not waned in any manner, ill-advised as it may have seemed. In fact, the feelings had grown ever-stronger, and with them the intense, visceral cycle of knowing that we’ll soon part. We made up our own starry-eyed future stories to tell each other, in which somehow we’d always end up together. We scheduled “dates” where we would each eat the same meal, maybe vegetable lo mein, and sync up the same Billy Wilder movie, so we could watch it simultaneously. Then we’d leave FaceTime on all night to simulate sleeping in the same bed. For Larissa’s birthday the month before Valentine’s Day last year, I gave her a recording of myself reading all nine of Salinger’s Nine Stories, because she told me she didn’t have time to read. So when the 14th of February came around I wanted to take it up a notch in the romance department, give her something we could experience together in the same place. The Philadelphia Orchestra’s All-Gershwin night provided just the ticket. After the quick kiss-on-the-cheek photo before the LOVE sculpture (in which I’m gazing off to the side, as if into an uncertain future), we hurriedly took our seats in the balcony behind the orchestra, with a bird’s eye view of the percussion section. That giddy feeling from the museum returned to us. We began to rise into that blissful weightlessness that only comes with the tuning of an orchestra. We could feel our bones being tuned along with the strings, our veins along with the woodwinds and brass. If the orchestra were a place, we would live in it. As they tore into “An American in Paris,” with its multi-colored, well-tempered car horns honking with all the alacrity of a traffic jam on Rue de la Huchette, I melted into Larissa’s arms and it was there I stayed, the two of us floating ever higher into the stratosphere for 90 minutes. It was there our goosebumps could be synchronized in reaction to the Ira’s heart-rending lyrics in “I Loves You, Porgy” and “But Not for Me.” We didn’t have to reach for something to tie us together. The gorgeous “Lullaby for Strings” induced in me an almost Pavlovian urge to sleep. I had listened to that piece every night as a kid, imagining myself in 1930s upper Manhattan, drifting away to the muted melodies of a street saxophone. The Gershwins took newsboy stickball melodies and rhythms and elevated them to the concert hall, and to my vagabond heart the same treatment was applied. I could feel the saudade of Jobim songs, the toska the old Russians wrote about. It was tangible. For me, it is only through music that the dichotomy – the concurrent ecstasy and pain – of being in love can be truly integrated, can make any sense. It’s why I once wrote Larissa a string quartet, and why, when she reciprocated with love songs, I listened to them on repeat every night as I fell asleep. 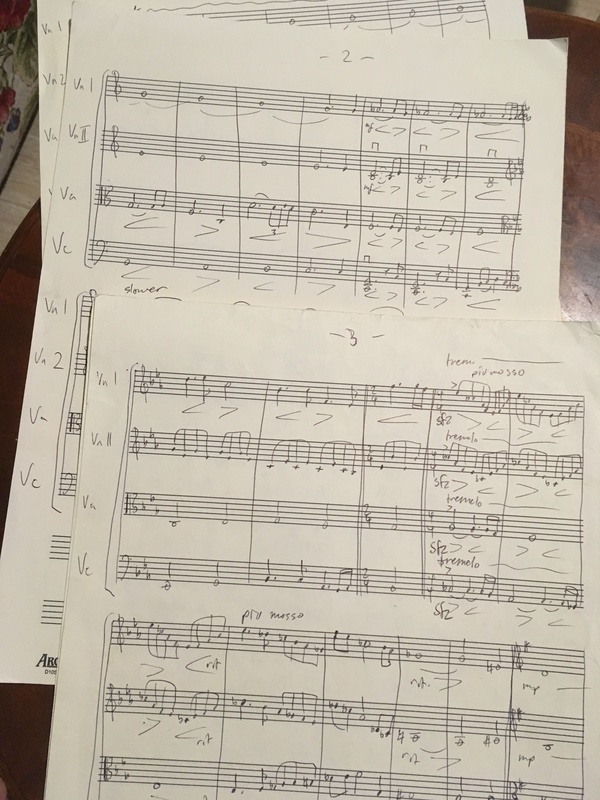 The string quartet Jesse wrote for Larissa. In the concert hall where a dizzying variation of “I Got Rhythm” came to a crashing end, we were plonked violently back into the reality of our velvet seats; soon to be ushered out into the blustery east coast night, soon to be silently driving back to Doylestown, soon to be waking up and wanly sharing a bagel and a crossword puzzle, soon to part ways at Philadelphia International Airport. To begin another series of moments shared remotely. It’s now a year later, and we’ve grown ever closer, despite the distance. Yet I’m not spending Valentine’s Day with my girlfriend. Instead we’re going to celebrate it a day later, because she’s coming to visit on the 15th. Today isn’t about distance. It’s about another list: Amy’s brown rice and black-eyed peas for two; mint chocolate chip ice cream — her favorite, white instead of green, so we can eat at home.